Please contact us for further information on these products or any other products. Similar to Cold Rolled commercial quality but possesses greater forming qualities. This product is utilised where yield and tensile strengths and elongation (ductibility) have to be guaranteed for its end use. Supraform is a range of hot rolled structural steels with improved formability and weldability characteristics. The Supraform HR range relates to the minimum respective yield strengths of each grade. All the material is pickled and oiled. Typical End Use: Automotive body and chassis components, any application where sharp bends are necessary, castors, etc. Supraform TM is a range of high strength, low alloy structural hot rolled steel with improved formability. This Supraform range states with the specific TM number which illustrates the minimum yield strength of each grade. Typical End Use: Automotive components, steel pipes for high pressure applications, mining equipment. Electrogalvanised steel sheet consists of a cold rolled steel substrate coated with Zinc by electrolytic deposition on a continuous line. Coating can be applied on either one or both sides of the steel sheet. Its applications extends to forming, drawing, stretching and bending processes during manufacturing. The coating thickness can be controlled. The coated material is suitable for welding and painting. Further surface treatment may be added such as oiling, chrome rinse and phosphating. The zinc coating thickness can vary from 18gm² to 54gm² coated one or both sides of the steel sheet. Typical End Use: Domestic appliances, Automotive components, steel furniture and air-conditioning, etc. Hot Dipped Galvanised steel is produced on a continuous Zinc coating line with either a Cold rolled or Hot rolled substrate. The product can be supplied with normal (regular), flattened minimised pangle or zero spangle finish. Coating may range from Z120 to Z450 coating (minimum coating 90gm² to 385gm²). Typical End Use: Building applications e.g. garage doors; steel roof trusses; structural members; – domestic appliances, air conditioner ducting, road signs, doors, Automotive components, general engineering. This material is produced by coating the sheet with paint on a sophisticated coil painting line to the colour of choice. The substrate may be cold rolled, hot dipped galvanised, aluzinc or electrogalvanised material, depending which end application the material is required for. The sheet may be coated both sides with the chosen colour or coated one side with the chosen colour and the reverse side with a neutral colour epoxy primer. Variations to a flat sheet are available with various embossed patterns that are embossed on the material after manufacturing. Typical End Use: Roof sheeting, paint pales, garage doors, domestic appliances(stoves and fridges), cold rooms, advertising sign boards, etc. Hot Dipped material where the coating constitutes of 55% aluminium, 43.4% Zinc and 1.6% silicon. The great advantage of aluzinc is its superior corrosion resistance, attractive appearance and excellent thermal and light reflectivity. The coating thickness is typically 100gm² – 150gm². Typical End Use: Roof sheeting, steel roof trusses, electrical switchboard cabinets, Structural sections, domestic appliances, refrigeration, air conditioner air ducting, light fittings, computer casings, electronic boxes, etc. This material is cold rolled steel coated with 100% hot dipped aluminium, coated both sides. This material has a very good corrosion resistance even in the presence of heat. This material offers a good thermal and light reflectivity and the product can be used in temperatures of up to 1100ºC. Coating thickness is typically 80 – 120gm². Typical End Use: Bakery trays, Automotive exhaust systems, automotive heat shields, chimney ducts, construction profiles, heating boilers, air conditioners, tanks, etc. 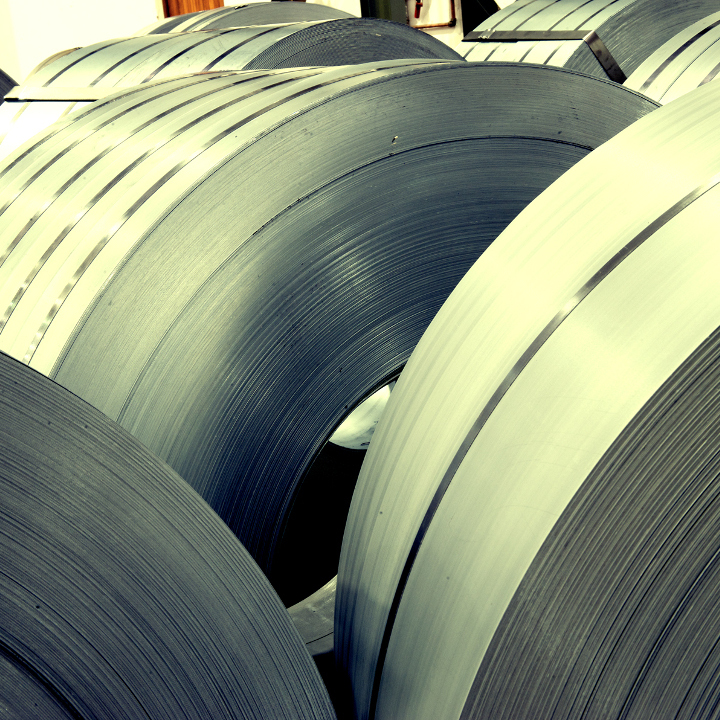 Tinplate is produced from a single reduced cold rolled steel sheet which is electrolytically coated with tin. The tin coating provides corrosion resistance to the steel substrate, and plays a beneficial role to the preservation of food. In addition the surface of Tinplate lends itself to silk screening. It is further widely used in the packaging industry in a wide range of closures. Other quality ranges available on request. Ask any of our qualified sales staff who will be very willing to assist you. 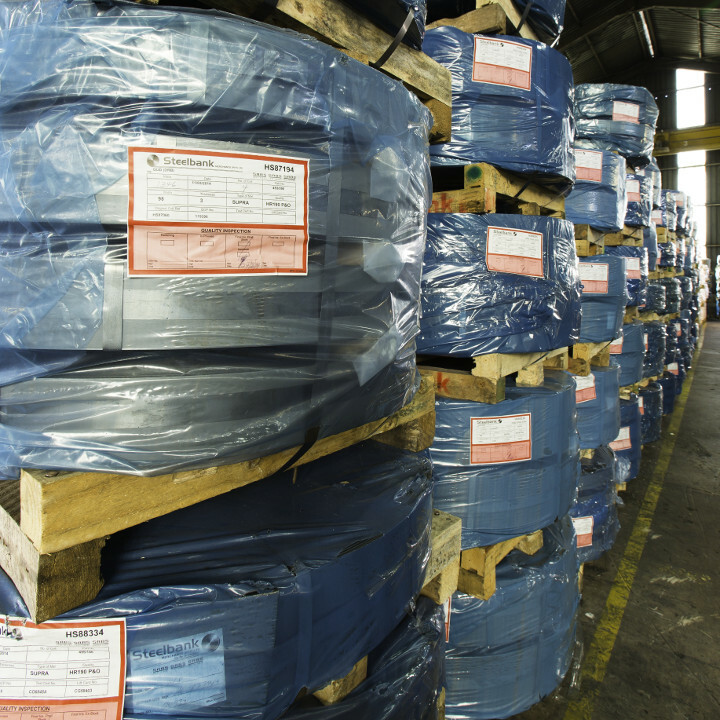 We source steel from around the world and will find the steel that you require.